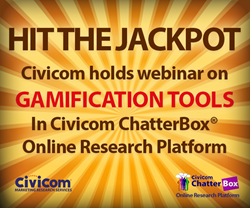 Leading global marketing research solutions provider Civicom® will feature Civicom ChatterBox® gamification tools in an upcoming webinar that will be available in several time zones from March 15-17. Driving respondent participation in online bulletin boards can be tricky, but gamification tools can help steer that engagement full on. Gamification capability is one of the highlights of Civicom ChatterBox®, an enhanced online bulletin board solution for marketing researchers. Gamification activities in asynchronous research discussions on an online research platform increase engagement significantly. Gamification effectively inspires respondents to proactively participate with the use of game components such as implementing challenges, leveling up after a number of tasks, and incentivizing accomplishment of challenges. Gamification is widespread in popularity as companies come to understand that it is an idea methodology for rewarding participants with status and achievement. It is also an excellent tool for achieving collaboration through teams and competition. Research surveys report that the gamification industry reached over $2 billion in 2015 and is expected to reach over $5 billion by 2018. Additional studies report high percentages of favorable views among the public toward the value of friendly competition. The gamification tools included in Civicom ChatterBox® are an ideal solution for asynchronous research studies. They help drive up maximum participation and can help eliminate the need for re-recruiting respondents due to possible unreliable insights from incomplete answers or disengagement. This in turn lessens the need to invest more time in managing respondents and saves researchers money in the process. The webinar will tackle different gamification capabilities available through the platform, such setting up a reward system or incentive options, implementing rankings or leaderboards, and monitoring participant progress. Attendees will also learn about the flexible report generation capabilities and easy-to-use analytics of Civicom ChatterBox®, ensuring efficient insight tracking and the ultimate success of a study.